The torque biasing Center differential enables your car to accelerate quicker and corner faster. How? By reducing the understeer and by sending the power to the wheels that could use it! The Helical AWD Center Differential powers both front and rear wheels. The drive torque will be distributed between the front and the rear wheels in the most optimal way proportionate to the available traction. This is a Torsen-type torque-sensing differential with a 40/60 asymmetrical front/rear torque split. The torque split changes automatically between 60/40 and 20/80, depending on the available traction. This virtually eliminates the power-on understeer. The max torque capacity is 16,000 ft*lbs for aggressive drag launches. Even if your stock VCU is not blown, the amount of torque that it could generate is not impressive. A good stock VCU can be slowly turned by hand, so the torque is less than 10 ft*lbs. In a typical road course 3rd gear, the VCU rotates about 1.5 times slower than the engine. If the engine generates the stock 320 ft*lbs, then on a stock car 55% of that goes to the rear. If the front wheels lose a little bit of traction, the rear torque would (after some slippage and a time delay) increase by only 10/1.5/320 = 2%, up to 57%. In lower gears, or on higher HP cars, it would be even less. But with the SCE Torsen center diff, the rear torque would instantly increase from 60% up to to 80%, even for high-HP cars, and in any gear. This differential is for all AWD 3/S cars. The ’94 – 99 model year 6-speed and the ’92.5 – 93 model year 5-speed version comes with a special modified version of a 25-spline 300M output shaft. 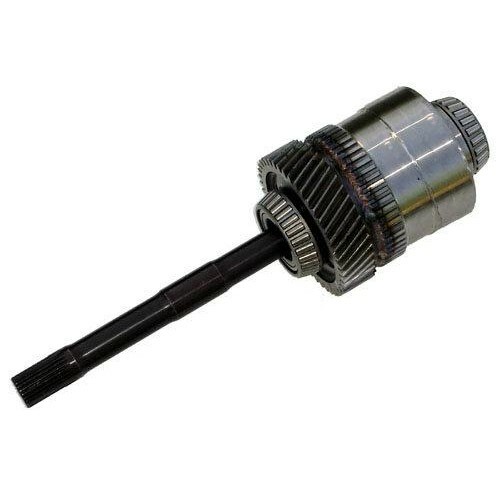 The ’91 – early 92 model year 5-speed version comes with a special 18-spline 300M output shaft. NOTE: The 18-spline version requires a “Front Output Shaft” from a 5-speed 25-spline transmission (not included, sold separately). NOTE: A good usable and non-damaged OEM center differential housing core is required. The core should be sent within 60 days, or it could be sent in advance before the shipment to avoid the core charge. The AWD Center Differential comes with something else others don’t have: a Limited Lifetime Warranty. This warranty applies even when raced! This warranty does not apply to the 300M output shaft, however no 300M shaft has been broken yet.